Here are a couple of snapshots of Dorena from the 1960’s. The store still stands as Kirk’s Mercantile. 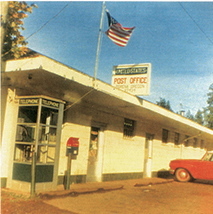 The Texaco Station is no longer there, and the Post Office has moved across the river. Not sure to whom the mystery shadow in the lower left hand corner of the first photo belongs. Any guesses?